Sunday’s NBA All-Star Game is taking a backseat to the apparent drama between former teammates Kevin Durant and Russell Westbrook. 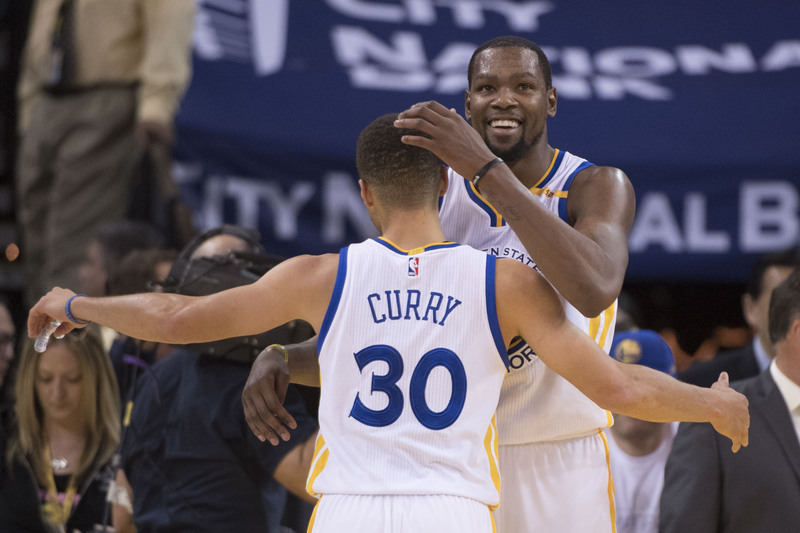 Though the two former Oklahoma City Thunder stars have mostly denied there are any hard feelings since Durant left for the Golden State Warriors last summer, the lead-up to the All-Star Game sure gave us plenty of examples to the contrary. For starters, the All-Star lockers for both players are basically as far apart as possible. Then you have Westbrook and Durant nowhere near each other for the Western Conference team photo. And if that wasn’t enough, Westbrook opted to take his pregame warm-up shots by himself, away from the rest of the West players. 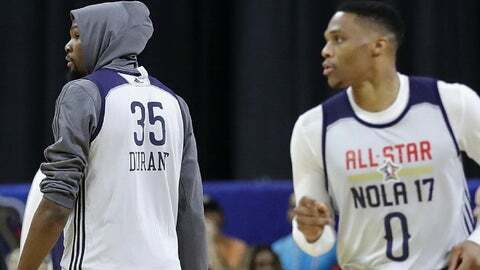 But one West All-Star decided to join Westbrook – former Thunder star sixth man James Harden, who spent his first three years in the league as a teammate of Westbrook and Durant. But maybe all is not lost between Westbrook and Durant. The two did have some interaction during the layup line and some final warm-up jumpers. KD passed the ball to Russ in the layup line. More news: KD made a jumper. Russ rebounded it & gave it back to him. Shooting-around protocol trumps free agency beef. All of this only heightens the anticipation regarding whether Warriors and Western Conference head coach Steve Kerr will play Durant and Westbrook on the floor together or if Kerr will opt to put the Warriors four All-Stars — Durant, Steph Curry, Klay Thompson and Draymond Green — on the floor at the same time with Westbrook.